Yes, they're crazy and insanely cute! 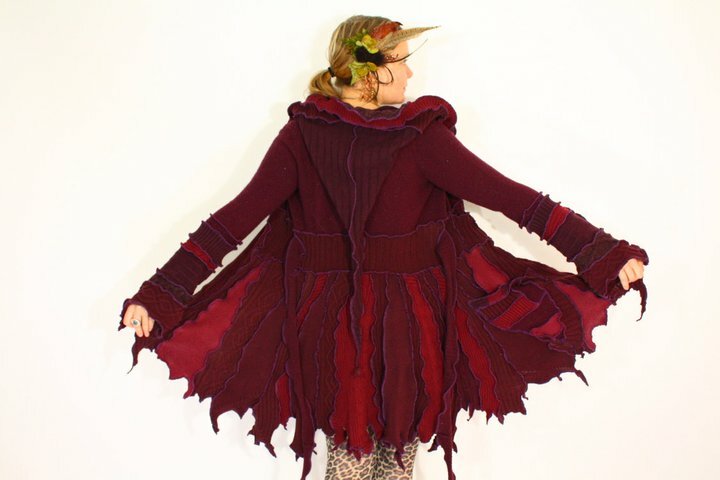 Living now in a farm near New York and after travelling the world quite a few times Kat O´sullivan is devoted now to make this lovely, mad and outstandingly beautiful sweater art infused by her adventurer free-spirited heart. You can find coats in every color of the rainbow or with all their colors at the same time! Every season, every landscale...Or black for gothic raven souls, or earthy green mossy and browns for dryads and forest dwellers... some with pointy super long hoodies for naughty pixies!! Put one of this coat over your daily wear and your total image will be completely transfixed into a daring fairy look. They look super cozy and durable too. 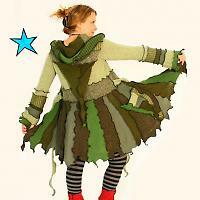 The sweaters have also some "hippie" flavor but the overall mood is that they are very fairy like. High quality Elf couture recycling materials that Kat has been making for over two decades now with a lovely eco friendly message and outstanding design that has been often imitated afterwards. Katwise happiness and love for nature vibrancy is highlighted in the uniqueness of every piece, they're all one of a kind and two are never quite the same, out of the hands of a skillful and passionate crafter. Above: winter coat... it leaves me speechless...! They may look a bit pricy (around 300 $ for the deluxe coats) but if you see the amounts of different pieces and rags in the pattern that has to be rather maddening difficult to make, so looks like they're very fair price considering the work they involve and that is not a cheap Chinese industrial massive production but a hand finished item.Also in the unlikely case that you wouldn't find one to fall in love with right away (I am CRAVING FOR THAT WHITE WINTER CLOAK (a hundred sighs!) you can still order a custom size or color, they encourage to contact for custom work. They can make from small sizes to extra large for your perfect fitting. Though they have quite a few "already to ship" listings in their Katwise Etsy store. They also have an official site but I recommend to check the etsy listings first and network with Katwise in facebook so you can see the latest pictures in their photo gallery. This burgundy tatterdemalion coat is reminiscent of a autumnal cascade of Japanese maple leaves. 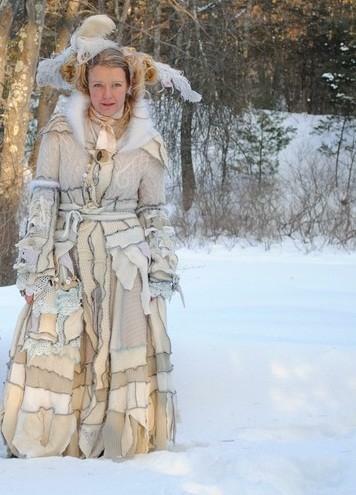 It has a double-zip front, a tie waist, a crazy-quilt pocket, and a long pointy hood. Do you want to see this lovely coats floating and spinning their colors for your eyes delight! Submitted by kat on 2011, May 9 - 18:00.